The Solomon R. Guggenheim Foundation has agreed to hand over Artillerymen (1915), a German Expressionist painting by Ernst Ludwig Kirchner, to the heirs of Alfred Flechtheim, a German Jewish art dealer who fled the Nazis in 1933, the museum and the heirs announced Thursday (4 October). The Guggenheim said in a statement that the restitution of the painting to the heirs, Michael Hulton of San Francisco and Penny Hulton of Potters Bar, England, followed two years of provenance research. The heirs have also successfully laid claim to German Expressionist works in other museum collections that Flechtheim left behind when he left Germany. Research showed that Flechtheim was the target of “particularly virulent anti-Semitic propaganda” before he fled to Switzerland, Paris and then London, where he died in 1937, the Guggenheim said. 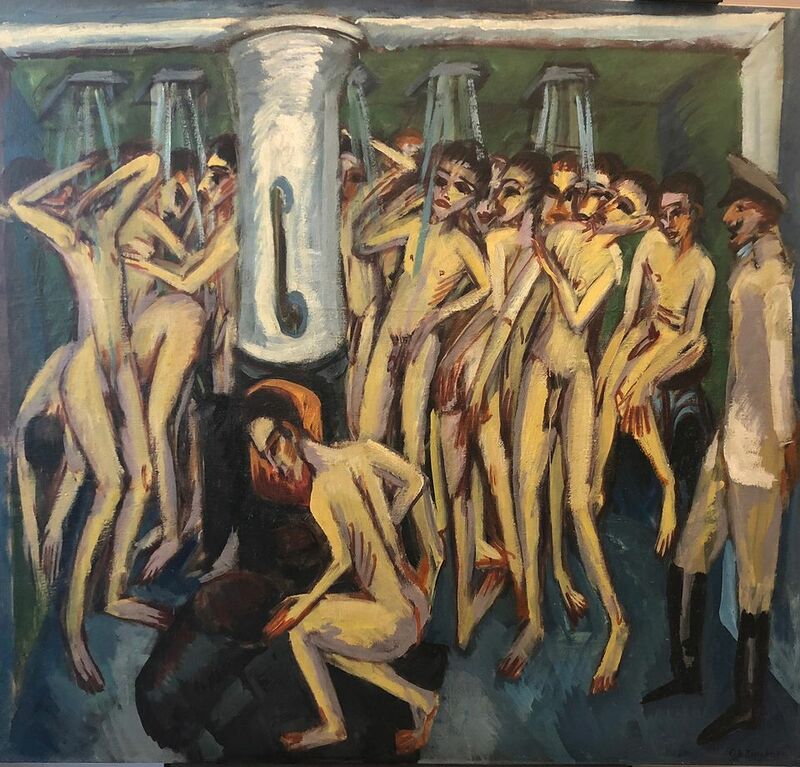 The painting was left in the possession of his niece, Rosi Hulisch, in Germany and then was acquired in 1938 by Kurt Feldhäusser, a member of the Nazi party, the statement said. Feldhäusser was killed in Germany in 1945 and left his collection to his mother, who consigned the painting to the Weyhe Gallery in New York in 1949, the foundation said. A collecting couple based in St Louis bought the work in 1952 and donated it to the Museum of Modern Art in 1956, it added. MoMA transferred it to the Guggenheim Foundation in 1988 in exchange for other works. “An essential part of the work of the Guggenheim Foundation is the ongoing investigation into the history and provenance of our collection, and we regard this responsibility with the greatest seriousness,” Richard D. Armstrong, director of the Solomon R. Guggenheim Museum and Foundation, said in the statement. The agreement on the painting’s restitution was reached in cooperation with the Holocaust Claims Processing Office of the New York State Department of Financial Services, the foundation said. “I am grateful to the Guggenheim for doing the right thing and for joining with the other institutions that have recognized the tragic fate of the Flechtheim family,” said Michael Hulton, Flechtheim’s great-nephew. Flechtheim’s wife, Betti, died under unclear circumstances in 1941 in Berlin after being ordered to report for deportation, according to Nicholas O’Donnell, a Boston attorney who has represented the Hultons. Hulisch (Michael Hulton’s aunt) committed suicide in 1942 on the eve of her deportation to a concentration camp, the Guggenheim said. Flechtheim (1878-1937) was one of the most prominent dealers in Europe before he fled Nazi Germany in 1933 after the press ran a stream of anti-Semitic articles targeting him. He was one of the earliest collectors of Picasso in Germany and represented Paul Klee, George Grosz, Max Beckmann and some French Cubists. His heirs have waged a concerted campaign to recover the works that Flechtheim left behind, some of which were sold by his former gallery employee, Alex Vömel, a member of the Nazi party. Last month, the Moderna Museet in Stockholm returned a painting by Oskar Kokoschka, a 1910 portrait of Marquis Joseph de Montesquiou-Fezensac, to the Hultons. In 2013, the heirs secured the return of another 1910 Kokoschka, a portrait of the actress Tilla Durieux, from the Museum Ludwig in Cologne. They are currently seeking the restitution of works in other German museum collections. The Guggenheim said that it relied on a catalogue raisonné of Kirchner’s works in acquiring the work from MoMA. The catalogue incorrectly stated that the painting had been owned by the German collector Hermann Lange, not Flechtheim, before Feldhäusser bought it, the museum said.